This Crafty Saturday display is courtesy of my oldest daughter. My kidlings spend a fair amount of time in my sewing studio rummaging through my big box of scraps. 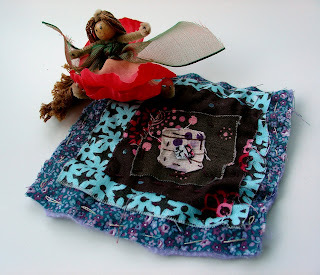 This Fairy Quilt is the latest result of their fabric forays. I love seeing bits and pieces of my bags in their creations. I'm also pleased that the kidlings like to sew - hopefully I'm following my mother's example and giving them a love of crafting! That is adorable. I am starting to feel that I do not do enough crafty stuff with my daughter. One more thing to add to my summer list! Very cute- both my daughters have an interest but not the patience, so maybe with time that will change!